This entry was posted in Hotels & Places to Stay, Insider Tips and tagged altitude sky lounge, Gaslamp Quarter, happy hour, Marriott, San Diego, summer by Maren. Bookmark the permalink. i’d love to be able to give my son and his wife the night away. they’re both struggling so hard to make ends meet that they forgot how to have fun. and San Diego has it all for them. i’d love to see the pictures of them relaxing on the beach with a smile on their faces. WOW !!! I’d love to win a night stay at the San Diego Marriott!!! It looks fabulous!!!! Congratulations Dawn on winning a night at the San Diego Marriott Gaslamp! Enjoy your stay in SD! San Diego Rocks!!! The Gaslamp District rocks!!! I will take my wife of 23 years and enjoy all the views of San Diego through her eyes from the best place in town! i would take my sweetie out for a romantic weekend if i won! I would love to stay at the San Diego Marriott Gaslamp Quarter and celebrate our two year anniversary. The Altitude Sky Lounge is a spectacular place to celebrate and enjoy the view of San Diego. It would be a perfect vacation get away to see the beautiful sights of San Diego. if I won I would take my fiance since he’s never been to San Diego!! I love San Diego and would love to share this experience with him. Ahhhh! This would be so romantic. Beautiful views, glass of wine, great dinner, then off to sleep in a beautiful room. Now that’s would be a amazing summer night. Love staycations! I’d love to spend a night exploring San Diego ending at Altutude! I would take my girlfriend out who recently turned 21 to a nice dinner then hit up altitude bar for an awesome finish to the night. Wow, this looks amazing! I have not yet been here. I know a very deserving couple who is need of a romantic “getaway”. Yes! I would love to have a one night stay with my fiance! The atmosphere up there is exciting. You are in the middle of downtown and yet you can see the bay area and enjoy the sunsets. I have a couple of ideas of how to spend a romantic evening there. If i win, i would surpise my girl with a beautiful sunset enagement and kiss our night away with our love we shared enjoying the pleasant views surroundings. Hard working single mom would love a night out.. Please pick me! I would LoVE to win this, single mother of two and never been on vacation. I have always wanted to go here, I would surprise my sweet boyfriend with a date if I won :). I don’t make very much money so it’d be nice to treat him for a change. I would love to stay past closing at the Marriott! I’ve only been to Altitude once and loved the view of Petco Park and the Gaslamp District in general. Please pick me! If I won, I would take my husband for our 21st anniversary in August. And walk out in the morning like a champ! If I won I would take my husband, who was my high school sweetheart and after 10 years apart we finally got married. We have two small children now and never get to go away for the night! Omg! This would be awesome! I will be in San Diego in early August and would love to stay here! I grew up in San Diego and love whenever I can visit! would love a night away with my husband. haven’t had that in years! I would treat my parents to a weekend getaway! That is pretty neat. I would take a nice little getaway with my girlfrined. If I won – I’d definitely take advantage of our three kids being with the grandparents – and enjoy a nice relaxing StayCation! LOVE this city! We’re coming back to San Diego for our 15th Weddng Anniversary! went to san diego last year in july for the first time ever! now that i live in california, would love to go back to see this from the roof tops! I’m from Nebraska and will be visiting San Diego next week for the first time. If I won I’d fly my husband out and extend my business trip for an extra day and we’d enjoy exploring the city together. Every view in San Diego is awesome. I especially like the view from the lighthouse at Point Loma. Every view in San Diego is beatiful. I especially love to stand at the light house at Point Loma for the spectacular view. Wish I was there! If I won I’d go to the San Diego Zoo & the beaches. I love Altitude ! I was vacationing in SD last September & my friend took me there for the first time – great view of Petco & love the drinks ! I have visited SD 3 times with SD Go Card biannual. I CHOSE San Diego to vacation there over Los Angeles because they have LOTS to offer on the SD Card that saved me money. I took a friend of mine who went for the first time back in 2010 cause I assured her she will fall in love with that city and she did! Guess what she said to me not too long ago? She wants to go back there this year to do it all again!!! It would be a honor to win a night stay at this hotel with her if by chance. The picture below was taken at Birch Aquarium in 2010. In addition to my last comment, if I won, I will be out and about to experience convention center across from this hotel, shopping, restaurants, get on top of Altitude Sky to enjoy breathtaking view of San Diego Bay, walking around inside of Marriott Gaslamp hotel and meeting people! If I won a night @ Marriott gaslamp I would invite my closest friends and enjoy the night @ altitude and gaslamp district. I actually had my wedding pictures done at altitude and everyone stayed at the Marriott. I would love to return to celebrate the memories!! My boyfriend and I had no date night in a VERY long time. We have 2 small children and 2 hectic jobs. We barely see each other and we love each other so much. We are great parents together but sometimes we just need our own playdate. love san diego, moved to washington (vancouver) and have been home sick since…..
Yay! I LOVE San Diego! I would love to come back to San Diego!! I miss this city so much. You know what I’d do?? ENJOY EVERY MINUTE!!! I would love a romantic getaway with my husband. We celebrate 15 years tomorrow! Two years ago, this month, my husband and I got married at the Prado and got a honeymoon suite at the Gaslamp Marriott. It would be great if we could celebrate there for our anniversary! If I won, I would jump in my car and drive as fast as I can from my house in Prescott, Arizona, til I arrived at the San Diego Marriott! Much needed break from the kids and the husband! Looks like fun!! Hope I win 😀 Looking forward to checking out Gaslamp Quarter! Awesome view…..would be great to be there for the 4th of july fireworks! It would be a much needed mini get away with my army man. Im not sure if my last post got posted: So posting again! I would pick the love of my life to spend the night at the gorgeous San Diego Marriott Hotel with me. We would spend our day time walking around the Seaport Village and take lots of pictures because there will never be enough pictures for me to get bored looking at. We’d go to lunch near there and possibly dip our feet in the ocean to cool off. I would want to walk to the West Field Mall near the gaslamp because I love to window shop! I window shop because I don’t have the money to buy all the wonderful items. Then we would check in at the hotel, enjoy the view from the hotel, shower, and get ready for a fun night out with my man! I have never been to the House of Blues so I’d want to go there and then after that where ever my man wants to go, which will probably be a bar. Take lots of pictures!! !…then walk back to the hotel, shower, and fall asleep in his arms on a big fluffy bed. And that’s what I would do if I win this contest. PLEASE!!! I haven’t had a vacation in years!! It would be an amazing 21 st birthday present to win this!! Nothing better than San Diego in the Summer! Love that place! An amazing little vacation with someone special. What a beautiful view! I want to move down to San Diego soon and this would be a perfect opportunity to check everything out. There is no place like San Diego! We just moved to this amazing city. I would love to surprise my wife with a weekend out. Plus we love Marriott. Used to live in San Diego, and this is my travel city of choice. We usually try to get down there a couple times a year! Padre/Charger games! Would love to experience the beauty and night life of San Diego Gaslamp Quarter..
Would be a Wonderful Birthday present to enjoy with my Man! Went to the Sky Lounge to pregame for a Padre game. Best part was you can watch the game from the Bar! I’d love to stay when I come to San Diego next month with my girlfriends, after a night out at Altitude. never been to SanDiego…my father passed away there 27yrs ago while on business …before he passed away he had called and said that SanDiego was the most beautiful place he has ever been to…would love to share/see what he seen in his last days! I’ve stayed there before, great place. It looks beautiful and would be a wonderful break – home away from home – for one night! I’m a Zonie and the Botanical Building would be my first stop! Have an amazing time as a mother of 4 and invite some girls to meet at the club for a nice night at the lounge!!! What a spectacular view and a perfect spot for two newlyweds to celebrate their marriage! 🙂 Pick my husband and I! Amazing! A perfect location for an adults-only getaway! I am a single mother of 2 1/2 year old twin boys! The possibilities are endless! I’d take my kids and I out of the 108 degree heat here in Phoenix! Ahhhh!!!! Would love a chance to stay at the Marriott!! Thanks for the opportunity! this Miami girl and my new hubby are headed to San Diego for vacation for my birthday in August….can’t wait to visit the San Diego Marriott Gaslamp Quarter AND the Altitude Sky Lounge! I would love for my husband and I to stay here. We need a getaway from this 100 degree heat here in NM. We love San Diego. I would relax and enjoy the view, weather, and atmosphere in the best city in the USA! When I lived in San Diego in 2011 I enjoyed every second of it. So peaceful and reminds me of my mission, goals and dreams in life. I love that in the word alone “Sky” is at a good altitude with beautiful views of San Diego’s beautiful scenerys. I left L.A> alone to work hard and live somewhere completely unknown. Now that Im living in Hollywood I wold have to give the credit to AMericas Finest City for comforting me in my new jpurney that I am currently walking through. would be great to get out of the heat and stay in beautiful San Diego at the beautiful SD Marriott. spend an exciting weekend with my lady enjoying the most beautiful sunsets and a glass of wine! This sounds amazing. I need to be here! This is a great place to be. San Diego has everything to offer. This would be a great stay-cation for me and the husband. This would be a great getaway for me and my wife….PICK ME!!! Great view of America’s Finest City! What would I do if I won? Um, I’d get my husband out there and convince him that THAT is where we should be living! A much needed stay-cation with the hubby after a long deployment would be nice! My family loves to escape the HOT, HOT Arizona summers by going to San Diego. The GasLamp Quarter is one of my favorite places to visit. I’d love to start planning my next trip this weekend by getting some awesome news. I Love San Diego! Can’t wait to see how the Gas Light Quater and San Diego skyline has changed since I moved away in 1977! Man if I won id spend my whole paycheck….gotta love the sky lounge. Love San Diego, try to get there at least once a year! Pick me! if i win i’ll skip over to coronado to tool around town – fun! Winning would make my summer (and year) complete!!! I love San Diego! San Diego is one of my favorite places and I usually stay at a Marriott. But I’ve never stayed at the Marriott Gaslamp Quarter. The Gaslamp area is really nice and the night life is lots of fun! The improvements continually being done in that area is fantastic! I would love to have some fun and see the views from the Altitude Sky Lounge!! How could you go wrong at a Marriott? Would love to say there for our 25th annivresary!! I love San Diego – wish we could afford to live there!!! Love San Diego, we love coming down to the zoo, balboa park checking out the latest areas like Gaslamp. So, were always looking for a Fun new place to stay. Looking forward to enjoying what you have to offer!! We are going there next weekend for a military graduation, and have not yet secured a place to stay. This would help out a great deal, that’s for sure. Would definitely save some money for other sights in and near the Gaslamp Quarter. SO Cool…Love the Marriott and San Diego. Stayed at the hotel a couple weeks ago just for the Sky Lounge. Haven’t been to San Diego in years and would love the chance to go back. My favorite place!!! We cime down every spring/summer and love the Marriot. They treat us like royalty and the rooms are great. Me and my Family are from Oregon City, Or. We will be traveling to Mexico for a mission trip and then when back in California will be staying in San Diego for a few days visiting family…..we hope to move to San Diego in the next couple years. It would be great to check out ‘the roof-top’ !!!! I would love to win. I’m in need of a vacation desperately. It looks so peaceful. A new experience…that we can pass on! looks really FUN. I love the gaslamp district! 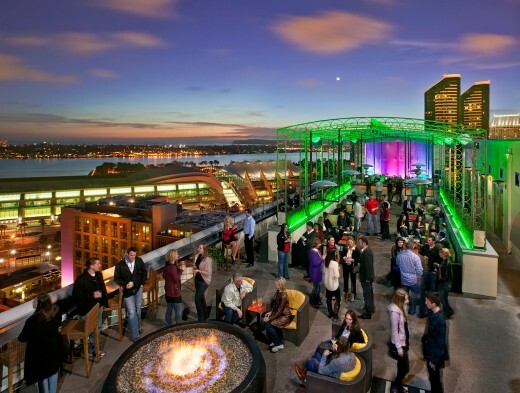 San Diego, Gaslamp Quarter, Altitude Sky Lounge and the Marriott are #1 on my summer wish list! Ive never had the chance to stay here, but of course would love to! So, please pick me so I can take my wife for a awesome night stay here and enejoy the weather and incerdible views!!! Looks great! San Diego has many nice views. Totally need of a vacation in my own hometown. Love me some San Diego!!! Would love to come back to San Diego this summer!! My favorite roof top bar in San Diego! Pick me! Pick me! Fun, I’m putting that on my summer list!